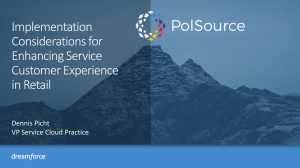 PolSource built the Einstein bot and combined it with Service Cloud and Live Message to provide DFHelp Event users with a personalized experience and quick resolution to their help requests. The bot we built automatically resolved 99% of the 22,000 chat-based help requests that the CEC received during DF. The automated resolution of chat cases freed-up CEC call center agents to spend more time with customers resolving more complex cases over the phone. The use of Lightning Flow shortened customer wait times and it helped guide agent resolution of customer cases. Lots of new Salesforce capabilities were used in this year’s CEC to power the end-to-end Dreamforce customer service experience. 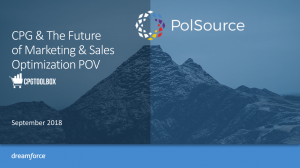 Our PolSource team enjoyed helping the Salesforce Service Cloud and CEC teams host private customer tours of the CEC and showcase its many best practices. 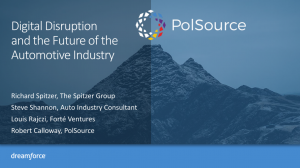 PolSource hosted an expert panel at Dreamforce to a sell-out crowd on Digital Disruption, and the Future of the Automotive Industry. The session featured OEM, Dealer, and Private Equity Executives talking about the kinds of digital services that OEMs, Dealers, Suppliers, and Financiers will need to offer their customers in order to thrive through the industry’s transformation. Watch the session here. 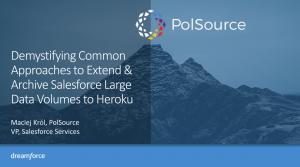 At Dreamforce, our VP of EMEA Services used a simple metaphor and 3 client case studies to explain the growth, cost reduction and innovation capabilities of Heroku. 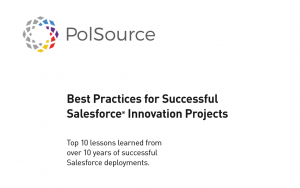 Our Top 10 Best Practices for Successful Salesforce Innovation Projects is sure to give you at least one useful tip to help your organization improve how it plans for, executes, and measures the success of your Salesforce initiatives. Download this short white paper here.